I already covered the Flags/Wings franchise early in this blog, but I wanted to give the '71-72 Wings their own post. I did some research on the Flags/Wings this past Saturday at the St. Clair County Library in Port Huron, browsing through the Times Herald microfilm. Detroit Red Wings. As a nod to their new affiliation, the Flags changed their name to the Port Huron Wings, and wore uniforms identical to the parent club. Detroit would also use McMorran Arena as their home for training camp. Ted Garvin was back behind the bench, along with General Manager Morris Snider. Garvin's new-look Wings finished the 1971-72 season in second place, with a 37-31-4 record. Their 78 points put them 11 points ahead of third place Flint, but 22 behind Huber Trophy-winning Muskegon. Despite the second-place finish and coming off a championship the previous year, the Wings averaged just 1800 fans per game. 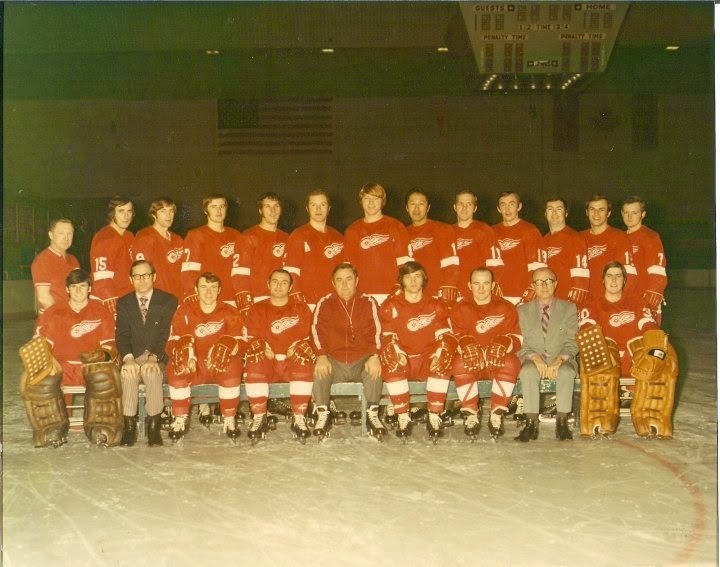 The Wings had the fifth-best offense in the IHL that season, scoring 276 goals. They were led by Len Fontaine, who had 41 goals and 86 points in 70 games. Don Grierson led the team in goals with 44. Four other Wings scored at least 20 goals that year. Port Huron was also fifth-best in goals against that year, allowing 262 red lights. The team used four different goaltenders that year. George Hulme and Brian Cropper were the main netminders that season, playing in nearly the same amount of games that year. Cropper played the majority of games in the postseason. The Wings began their defense of the Turner Cup against the Flint Generals. In a close best-of-five series, Port Huron downed Flint in four games to advance to the semi-finals. The Wings then faced the Fort Wayne Komets, who earned a first-round bye. This was another best-of-five affair, and Port Huron needed all five games to eliminate the Komets, taking Game 5, 4-2, at McMorran Arena. In the Turner Cup Finals, the Wings faced the Muskegon Mohawks, the top team in the league, who made quick work of the Dayton Gems in the semifinals. The Mohawks were heavily favored, but Port Huron stunned the critics by jumping out to a 3-1 series lead. Muskegon won Game 5 at home, 5-1, to force a Game 6 in Port Huron. postseason. After a scoreless first period, Port Huron jumped out to a 2-0 lead in the second, on goals from Al Genovy and Bob Brinkworth. It would remain 2-0 until late in the third, when the Wings' Steve Sutherland and Wayne Ego scored two empty-netters late in the third to seal the victory. Exuberant Wings fans poured on the ice after the buzzer sounded, celebrating Port Huron's second straight Turner Cup victory. 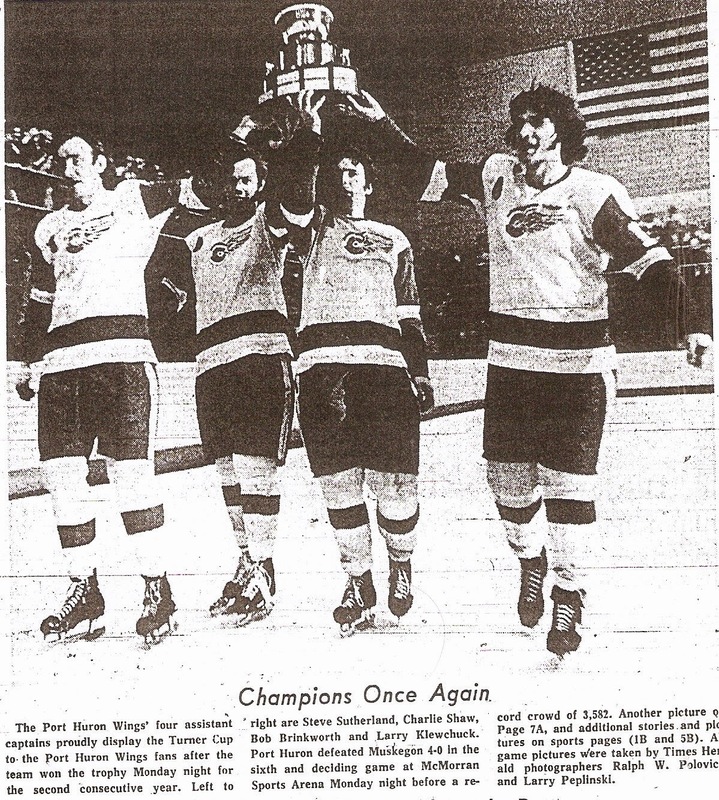 Commissioner Bill Beagan, during the Turner Cup presentation, called Port Huron "The Green Bay of the International Hockey League". Sutherland, Brinkworth, Charlie Shaw and Larry Klewchuck paraded the Turner Cup around McMorran ice. Wings fan Walt Gierman, in turn, paraded goalie Brian Cropper (pads and all!) around the ice. Decent program at 29 pages. All of them, of course, are black-and-white. There are some game pictures, and articles about each team in the IHL that year. There's also a letter from Morris Snider, the Wings' GM, and an article from Wings Coach Ted Garvin. Local advertisements include Chick n' Joy, Bob Bair Chevrolet and London's Dairy. 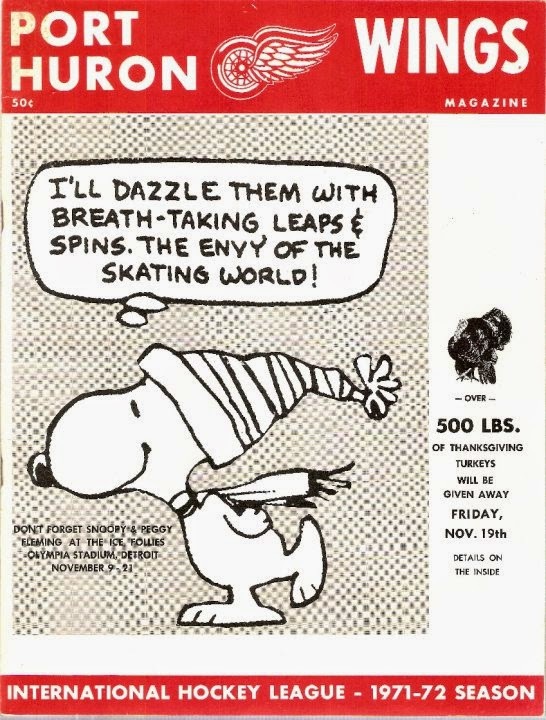 The Snoopy cartoon, strangely, is for an upcoming event at the Detroit Olympia, not McMorran Arena. There is also a flyer for an upcoming Wings-Komets game, in which "over 500 pounds of turkey will be given away between the second and third periods". Can't argue with that! Last Saturday, I went to the St. Clair Library in Port Huron to do some research on my Flags/Wings programs. I printed off a few articles and took some notes about the game programs I had, along with the 1972 championship and the 1981 folding of the team. I found the picture of the Turner Cup being paraded around the ice, and the picture on the left as well. This was taken with about 2:39 left in the game, shortly before the Mohawks pulled goalie Glenn "Chico" Resch for an extra attacker. Some fan at the game tossed a live rooster on the ice, obviously hinting the Mohawks were chickens. On one hand, that's pretty funny, but on the other, I feel bad for the rooster, probably scared to death. And how does someone sneak a live rooster into a hockey game?! Or why, for that matter? Pretty cool pictures and articles I found. I was able to get the results for most of the Flags/Wings programs I own. Not this program though, as there was no date. Might have to go check the archives out again. "A Night to Remember", Port Huron Wings 1972-73 Season Magazine, Author Unknown.